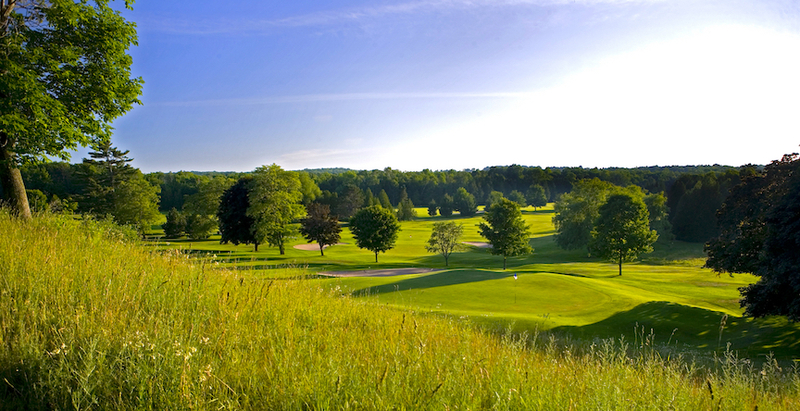 Charlevoix, MI – Long recognized as a must-play experience in northern Michigan, the historic Belvedere Golf Club has turned back the clock thanks to a find that has purists and golf aficionados alike waiting in anticipation for this spring. In the fall of 2016, the demolishment of an old building in Charlevoix led to the discovery of famous golf architect William Watson’s original drawings of the historic course. While aerial photos existed from the late 1930’s, there was no actual documentation of the original parkland design with its classic flowing fairways, strategic bunkers and subtle greens. After 95 years, with the genius of William Watson having resurfaced, the decision was made to begin a restoration that would restore much of what had been lost over the decades. Under the watchful eyes of golf architect Bruce Hepner and course superintendent Rick Grunch the restoration project will be completed for the 2017 season. Hepner, a former Tom Doak disciple, has been highly regarded in the industry as a specialist when it comes to classic course restorations by legendary designers such as Ross, Tillinghast, MacKenzie and now Watson to name a few. included restoring and expanding lost fairway and approach areas, as well as bringing back lost bunkers. The work has brought back some of the strategies for playing the course that Watson originally intended. The strategy design is most evident at the historic 16th hole, a favorite of legendary golfers like Gene Sarazen, who spoke highly of the hole even late into his life. The classic short par 4, known for its well-positioned green set in the hillside, lost some of its green complex over the years, as well as a strategic bunker and fairway approach area on the left side. Hepner has brought the expanded putting surface back in play, and a strategy that again takes the golfer up the left side for the best approach angle. Examples like the 16th hole can now be found throughout the golf course. The restoration has clearly brought the course’s historic strategy and challenges back into play while still maintaining the playability and fun for all levels of players.